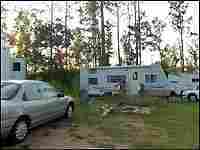 Stuck and Suicidal in a Post-Katrina Trailer Park Since Hurricane Katrina hit nearly two years ago, 100 families have been living in near isolation at Scenic Trails, a FEMA trailer park deep in the woods of Mississippi. The community is plagued by crime, drugs, and depression – and residents see no way out. Part II: What Can Be Done? 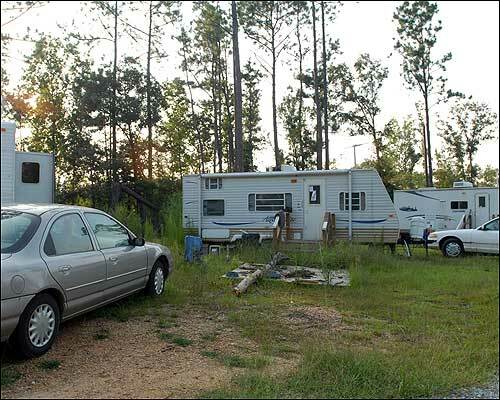 The Scenic Trails trailer park in Perkinston, Miss., is home to more than 100 families displaced by Hurricane Katrina. Joey Noles built a big dog house outside of his FEMA trailer at Scenic Trails, where he has lived since Hurricane Katrina hit nearly two years ago. The first morning of my visit to Scenic Trails, I was walking the path between some trailers when I bumped into a man named Tim Szepek. He was young, tall, and solidly good-looking. I asked if I could speak to him for a moment and he agreed. We found a spot of shade beneath a tree, and I started with what I considered a casual warm-up. "What's it like to live around here?" I asked. "Well," he replied, "I'll be honest." "Ain't a day goes by when I don't think about killing myself." And so began my time in Scenic Trails, a FEMA trailer park deep in the Mississippi woods where 100 families have lived in near isolation for close to two years. Though Szepek was the first resident to tell me he wanted to commit suicide, he certainly wasn't the last. The day I spoke with him, three other residents confided the same. The second person was Stephanie Sigur, a 28-year-old mother of two. She was sitting in front of her trailer at a picnic table, her daughter on her lap, when she explained that if it weren't a sin, she would have blown her brains out months ago. "I know it's a bad thing to say because I'm a parent," she told me as her toddler played with her hair, "but I can't live like this no more." Stephanie Sigur and Tim Szepek aren't alone. According to a recent study of 92 different Katrina FEMA parks published in the Annals of Emergency Medicine, suicide attempts in Louisiana and Mississippi's parks are 79 times higher than the national average. Major depression is seven times the national rate. When I first read those numbers, I found them hard to believe. But after three days at Scenic Trails, they made a lot more sense. The residents there, in essence, are trapped. It is no longer possible for them to live outside the trailer parks. Prior to Katrina, most of the people who now live in the parks were renters. Along the Mississippi coast, a family of four could rent a two- or three-bedroom apartment or small home for around $500 a month. But when the storm wiped the Mississippi coast clean, it took out all the housing infrastructure that supported these people. Most of them are minimum-wage workers who live paycheck to paycheck. Today, a two- or three-bedroom apartment in Hancock County, where Scenic Trails is located, costs $800, $900, even $1,000 a month. This is an impossible amount of money for the people who live in the parks, and there is no immediate end in sight. FEMA says it would like to close the parks, but state and federal government plans to rebuild low-income housing for Mississippi coast residents have yet to break ground. Housing experts says it will probably take years to produce enough low-cost housing to move people out of the parks. And so they are stuck. And the place they are stuck is not the kind of place you would want to spend an extended amount of time. For two years, many have lived in travel trailers intended for weekend use. Families of four housed in a space the size of most people's living rooms. Worse, as time wears on, the communities around them seem to be falling into a kind of madness. At Scenic Trails, almost everyone at the camp has been burglarized at least once. Meth and cocaine addiction is rampant, and residents seem to be turning against one another. Recently, the park has seen a rash of animal mutilations. One resident told me that her cat had come home bleeding — a long, thin razor cut along its leg. Another resident said his dog's throat had been cut, and several people reported that someone in the camp had been feeding anti-freeze to dogs. No one seemed to have a particular suspect in mind. There was no specific theory of why. That was just the way things went at the camp nowadays. With no way to leave, people were angry and frustrated, and so they act out. On the animals. On each other. On themselves.